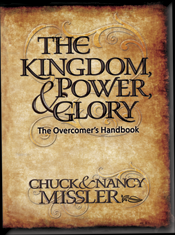 The Kingdom, Power & Glory is an excellent collaboration between Chuck and Nancy Missler. Nancy’s interest in the future inheritance and rewards for believers was especially sparked by a book that Chuck gave her. That led to intense study and writing, and then the publication of this book. During the process, Chuck was drawn to the issues being raised and it was agreed that the original book should be expanded with Chuck’s contribution. He also produced some briefing packs as part of the series to go further into some specific areas that people began to ask about. Everything connected to The Kingdom, Power & Glory is offered here for your edification. Many people have said that this material has helped them understand the scope of what God is doing, and how all of Biblical history fits together. The Kingdom, Power & Glory is an extensive look at what comes after the Rapture. Does our behavior as Christians matter once we are assured of our salvation? Being “born again” is just the beginning of an intimate relationship with God. This book will change the way you live your day to day life and give you a “heavenly” perspective. Go here for a more extensive description. The Kingdom, Power & Glory Study Guide is designed as a companion to the textbook and DVD presentation. Each section has the learning goals, Discussion Questions for a small group, Personal Questions to go deeper, Young Adult Questions to make the study more relevent to youth, and finishes with Devotional Notes that include selected verses for further meditation. The Kingdom, Power & Glory Seminar on DVD. Wouldn’t it be great to experience a seminar done by Nancy Missler? Now you can! This DVD set has nearly 14 HOURS with Nancy showing you the insights that she wrote about in her book. Nancy’s teaching challenges Christians to become “overcomers” by laying before them the magnificent future that will be inherited by the faithful and obedient. This is not about “salvation by works” but opens our eyes to what we may gain or lose when we stand for rewards before Christ. This series was recorded before a live audience over several weeks time. LEADER’S GUIDE. Whether you are an experienced Bible Study Leader or if this is your first time leading a group, this leader’s guide is designed to make it easy. This guide includes preparation and suggestions for leaders, ideas for Young Adult Leaders, and “Different Teaching Options”. It also has the Discussion questions and answers; an outline of each session; and a CD with all of the charts from the book. These items are available as downloads. Except for the MP3, they are in PDF form. If you do not have Adobe Reader, you can get a free copy by clicking HERE. Eternal Security One of Christianity’s most controversial issues – and one of our most frequently asked questions – involves the concept of Eternal Security. There are good scholars on all sides of this issue, yet we felt it would be useful to explain our own views on this highly charged subject. This study contains 2 hours of teaching. Inheritance and Rewards Are all believers going to be equal in heaven? Wasn’t it all decided at the cross? Is there a difference between overcoming sin and bearing fruit? We have been promised an inheritance in the Kingdom to come. But is there more that is required of us than just our acceptance? Does behavior in this life really influence our future? The Origin of Evil is a big issue. Why hasn’t God simply wiped Satan and sin out completely? It’s disturbing to recognize that Satan tempted Jesus by offering Him the kingdom when he tempted Him in the wilderness, as recorded in Luke 5. How could Satan lay a legitimate claim to these? Find out. The Whole Counsel of God Our Lord repeatedly instructed us: “Be not deceived.” That is an imperative: a command, not simply a suggestion. But how? What are the tools to prevent our being deceived or misled? Find out how to use context without being blinded to the truth of Scripture. Thy Kingdom Come “Thy Kingdom come….” (Matt 6:10) is part of the “Lord’s Prayer” and yet few Christians have any idea what it is really about. Not only were we instructed to pray for its coming but it is the first thing we are to pray for! Now is the time to prepare for its coming. Dear Chuck and Nancy Missler. The last 4 years we have read around 200 books and found the Kingdom, Power and Glory book to be in the top 3, maybe the number 1 book. It really opened our eyes and made us with such clearity understand the purpose and call of God upon our lives. We are forever thankful for what you two have put together by the Holy Spirit. We love to give this book as gifts to other leaders around the world and will continue to do so. Thank you so much for you wonderful work and powerful words. Each week a group of us meet as a Lifegroup to discuss Christ, both in his glory, in our lives, our daily life and growing as individuals. We are always looking for ways to further get to know Jesus. 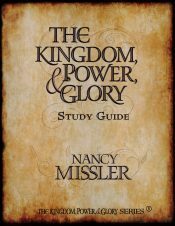 I was wondering, is there a ‘prepackaged’ version of The Kingdom ,Power and Glory which includes the study plan, as well as the books and seminar information, or are they all purchased separately? And do we need all the resources to work through the study guide, or just one? Thanks for the good words, Jess! At this point, we do not offer a package, but your question is bringing it back to our attention. We’ll discuss a “Leader’s Package” and see what we can do. Since there is an ocean between us, shipping is also an issue, so we will think in terms of downloads as much as possible. When we have an answer, we will post here.